There are fountains in almost every large city around the world – standard ones, sweet-looking ones, beautiful ones, singing ones, colourful ones, funny ones – you name it. The truth is that every city should have a beautiful fountain in order to attract more tourists. The more, the better. Trevi Fountain is known for being the largest baroque fountain and also one of the most important landmarks in Rome, Italy. With its impressive size – a height of 25,9 metres and a width of 19,8 metres the fountain is also one of the most beautiful sculptures in Rome. The central figure of the fountain is occupied by the figure of Neptune and around it there are two statues of newts. The first of them is trying to tame a fiery horse symbolizing the stormy sea, and the other holding a horn in his hand. 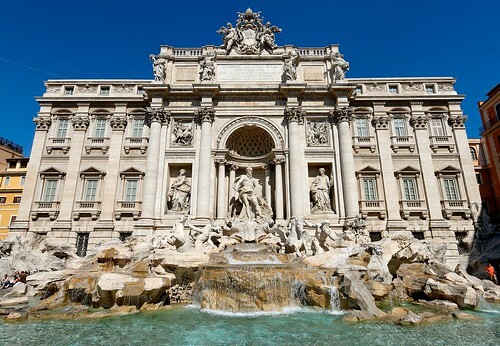 Fontana di Trevi becomes particularly popular worldwide thanks to a film of Federico Fellini, called “La Dolce Vita”, where the main female character immerses in its waters. The legend says that if someone throws a coin into the waters of the fountain, they will visit Rome again. This grand mix of lights, colours and rhythms combined with water lies between the Palau Nacional and Placa d'Espana. The fountain is built by the designer Carles Buigas in 1929 on the occasion of the International exhibition in Barcelona and since then it has become one of the main tourist attractions in the city. The Magic fountain has three concentric circles that “dance” in the rhythm of music, which varies from famous movie soundtracks such as The Godfather, The Lord of the Rinds and Gladiator, to the Spanish Zarzuela, to Freddie Mercury's song “Barcelona” and arias sung by Mantserrat Caballe. The unique light, music and water show is performed during the whole year. The historic Italian city located in the Lazio region is a popular tourist destination, visited by people from all over the world. One of the most charming attractions here that really amaze visitors is Villa d'Este, which is especially famous for its fantastic gardens. The Tiburtine fountain recreates the abundance of water in the area around Tivoli. Undoubtedly, Las Vegas and Bellagio are some of the most popular gambling destinations in the world, but there are definitely more attractions for the tourists. The Bellagio Fountains are a refreshing addition to the numerous options for entertainment that the place offers. The professional arrangement of the water jets, allowing the water to rise to 460 metres thanks to the total 1214 water devices, and the music synchronization turn this place into one of the most romantic and suitable for a proposal of marriage places in the world. The fountains are filmed in multiple movies, TV shows and other publications. The fountain is made in 1932 and since then it takes its place in Hyde Park in central Sydney. The Archibald Fountain's architecture is inspired by the Greek and Roman literature and art. The splendid fountain depicts a bronze sculpture of Apollo surrounded with other mythical figures and animals. The huge fountain Jet d'Eau, which is one of the most-visited places in Geneve, is literally emblematic for the city. It is located on the place where the Rhone River flows into the Geneva Lake. The fountain sprays water jets in the sky at a speed of 220 km/h, reaching a height of 140 metres. It is functioning during the summer – from May to September, and also during the motor show in March.